Starting in January 2015, PADI Members may now purchase PADI eLearning® courses from the online shopping cart or from their PADI Sales Consultant. Student divers may continue to purchase eLearning courses from a dive center website, the PADI website, and order gift passes from padi.com. 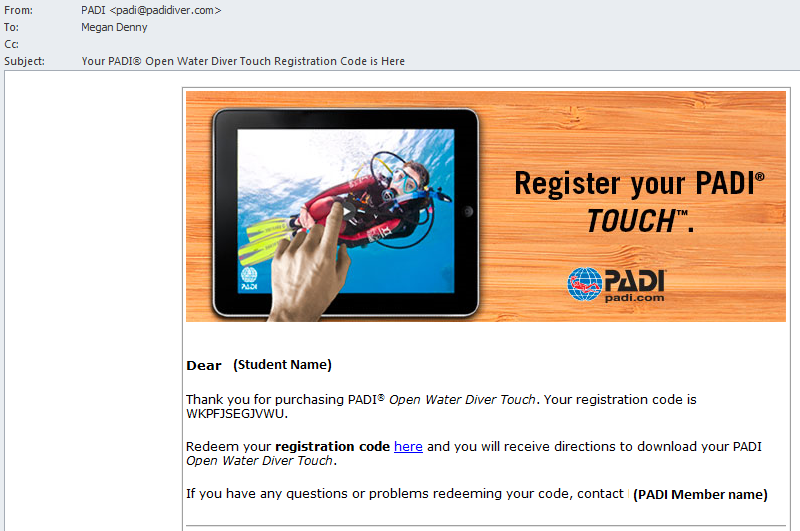 Below are the steps for a PADI Member to purchase eLearning or Touch codes for their students. If you are ready to process an eLearning student, please scroll down. #1 Order an eLearning or Touch course from your PADI Sales Consultant or the Shop Online section of the PADI Pros Site. Codes may take up to one hour to appear on your account. Important: due to laws governing minors on the internet, you will not be able to send a code to students younger than 13. Divers 10-12 should purchase the code from your website, or PADI.com. #2 Log on to the PADI Pro’s Site and click Online Services –> Online Processing Center. Choose the new PIC Online if prompted. Click on Available Code(s) under eLearning Registrations. Equipment Specialist and any Open Water Touch codes purchased prior to 2015 will appear under Touch Registrations. Open Water Touch purchases from 2015 or later (aka Open Water Certification Pak – Offline) will appear under Certification Paks. #4 Select the course you’d like to send to the student. #5 To send a code, you’ll need to enter two pieces of information: the student’s name and email. Your student will receive an email with their Touch or eLearning access code and information on how to get started. The student will create a PADI “Single Sign On” account or login using existing credentials if they already have an account such as ScubaEarth or eLearning. Please check that you’re using a supported browser. Our website is designed to work with the most current versions of Internet Explorer, Chrome and Firefox. Codes can take up to an hour to appear in the online processing center. In some cases, logging out of the Pros Site and logging back in is helpful. For assistance purchasing an online course, contact your PADI Sales Consultant. For help with purchased codes, please contact PADI customer service at +44 (0) 117 3007234. #1 Start in the online processing center. Click on the Redeemed Code(s) button for eLearning or Touch as appropriate. 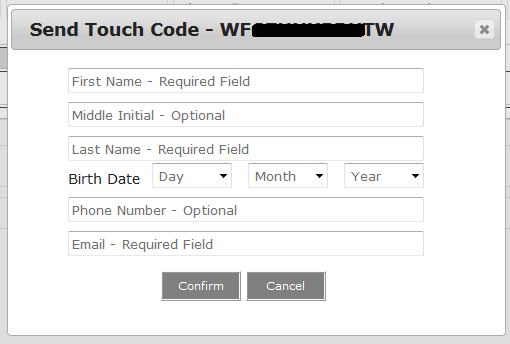 … OR pull up their information using the access code the student received in their initial email. Or the PADI ID that appears on their course completion record. If the student did not purchase their eLearning or Touch product through you to begin with, this is the method you will use to process them. In either case, the student’s information will be pre-populated. #3 The next step is to confirm the student’s contact information and upload a photo. #4 Once this is done, click Continue Processing Selected Students. #5 The last step is the familiar PIC Online interface. Add the cert location, date, etc and complete the process as normal. Q1. What is the PADI ReActivate™ program? Q2. Why create a new program? A recent survey of PADI Divers showed that of those who were not actively diving, more than 97 percent intended to dive in the future. When asked what would get them back in the water, two popular responses were: “a refresher course that I can complete quickly” and “a prescriptive approach that refreshes only what I’ve forgotten.” ReActivate is designed to give divers what they want – a quick way to refresh what they need to dive comfortably again. The previous Scuba Review program was effective, but not very prescriptive. The new program provides a huge opportunity to re-engage already certified divers and get them to re-ignite their passion for diving and drive them back to PADI Dive Centres and Resorts. Q3. Will this replace the current Scuba Review program? Q4. How does this program work? The ReActivate program consists of two sections: knowledge review and in-water skills refresher. To receive a ReActivate date on a replacement certification card, the diver must complete both sections. Some divers may decide to complete only the knowledge review, but the program encourages all participants to complete both sections. Divers complete the knowledge review material using either ReActivate Touch or or ReActivate Online. ReActivate Touch is an interactive program that works on tablets and mobile devices. It can be purchased two ways – from a PADI Member who provides a ReActivate Touch code or directly through the PADI Library App from the appropriate App store. Divers who purchase the Touch version on their own are required to affiliate with a PADI Dive Centre or Resort. ReActivate Online is an interactive program designed for personal computers. Divers purchase the access code for ReActivate Online from a PADI Member. After completing all topics in the Touch or Online product, the diver takes the ReActivate Quick Review online as a final assessment. Upon successful completion, divers can download and print a ReActivate Certificate that includes a unique code. The instructor who completes the in-water skill portion enters the code while processing the diver’s ReActivated certification card online.